Boeing has conducted the first flight of the U.S. Air Force’s KC-46A tanker. The manufacturer said Tuesday the first airborne tests occurred over three and a half hours. During the flight, Boeing said its test pilots took the tanker to a maximum altitude of 39,000 feet. Operational checks were performed on engines, flight controls and environmental systems as part of the FAA-approved flight profile. Before further flights, the team plans to conduct a post-flight inspection and calibrate instrumentation. Boeing said the newest tanker is the KC-46 program’s seventh aircraft to fly. The previous six have completed 2,200 flight hours and are being used for testing and certification. 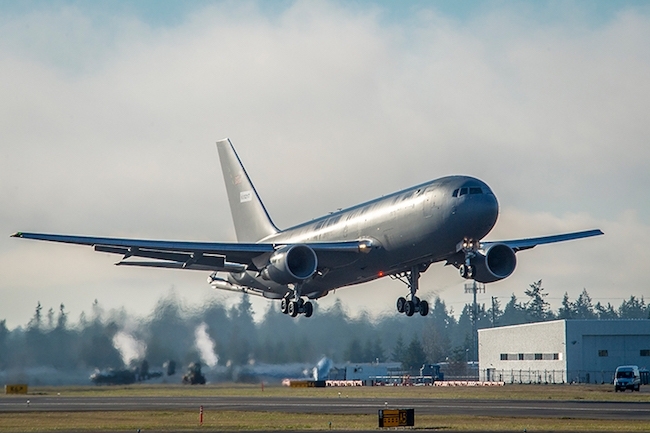 Based on the 767 airframe, the KC-46 is a multirole tanker that can refuel all allied and coalition military aircraft compatible with international aerial refueling procedures and can carry passengers, cargo and patients. Boeing is currently on contract to deliver 34 of an expected 179 tankers for to the service.